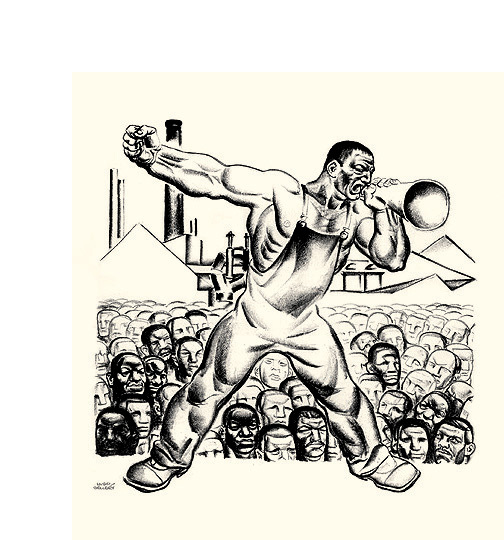 Primary Accumulation 19= 1933, Lithograph. Ryan 22. Edition 133. Signed in pencil. Image size 13 5/8 x 13 3/4 inches (346 x 349 mm); sheet size 22 1/2 x 15 1/8 inches (571 x 384 mm). A fine impression, on the full spread sheet with accompanying text page, on cream wove paper. A mended tear in bottom right sheet edge, well away from the image, otherwise in excellent condition. From the portfolio of 60 lithographs by Hugo Gellert, with accompanying text, Karl Marx' Capital in Pictures, printed by E. Desjobert, Paris, France in 1933. The title number refers to the page number of the accompanying text. 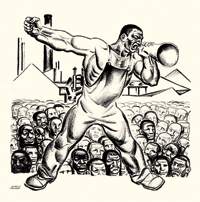 The work was also published in a book version Karl Marx' Capital in Lithographs, Ray Long and Richard Smith, New York, 1934. 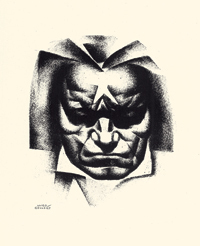 Ludwig van Beethoven= c. 1935, Lithograph. Image size 8 1/2 x 7 inches (216 x 178 mm); sheet size 19 3/4 x 16 inches (502 x 406 mm). A fine, rich impression, on the full sheet of cream laid paper, in excellent condition. 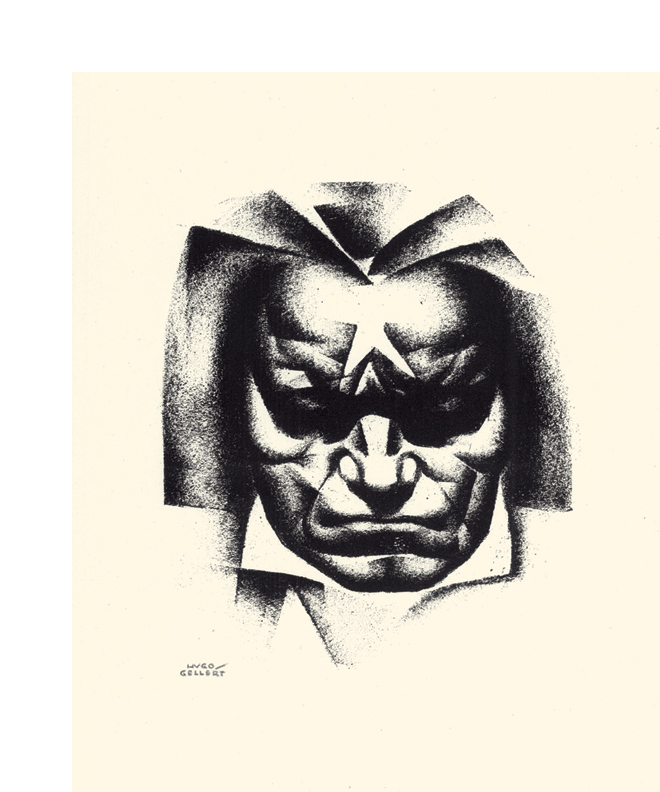 A powerful and dramatic portrait of the revered composer in Gellert's classic, modernist style. Scare in the pencil-signed version. 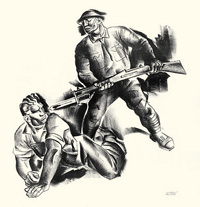 A Wounded Striker and the Soldier= 1936, Lithograph. Ryan 58. Edition 50, only 33 printed. Signed in pencil. Image size 13 1/2 x 12 3/8 inches (343 x 314 mm); sheet size 22 7/8 x 15 7/8 inches (581 x 403 mm). A fine, rich impression, with full margins (1 1/2 to 7 inches), on the full spread sheet with accompanying text page, on cream wove paper, in excellent condition. From the portfolio Aesop Said So, a work of 20 lithographs with accompanying text, drawn and written by Hugo Gellert in 1936. The portfolio was also published in book form by Covici Friede, New York, 1936. An "American Artists Congress" print. 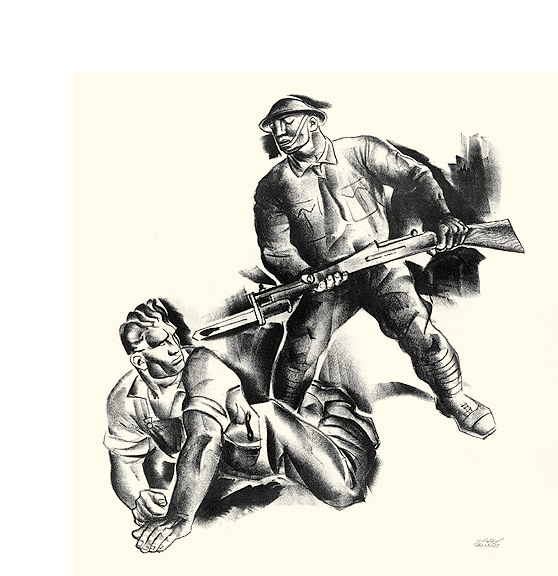 Illustrated in Commemorative Exhibition of the 50th Anniversary of the American Artists Congress (1936-1942), ACA Galleries, New York, 1986.